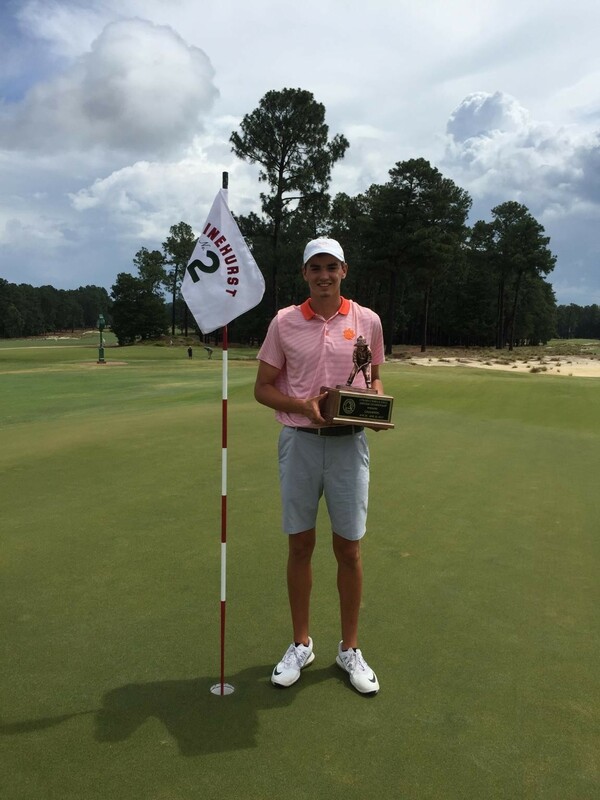 Clemson, S.C.—Clemson golfer William Nottingham won the North-South Amateur at Pinehurst No. 2 on Friday with a 1-up victory over James Anstiss. Nottingham is just the second Clemson golfer to win the tournament in its 117-year history. The North-South Amateur is one of the most prestigious amateur tournament of the summer schedule. Philip Mollica is the only Clemson golfer to capture the winner’s trophy previously, an accomplishment he realized in 2007. Previous winners include Jack Nicklaus, Curtis Strange, Davis Love and Corey Pavin. It was a long week of golf for Nottingham, who just completed his freshman season at Clemson. The native of Kingport, Tennessee played 120 holes over five days. Nottingham made an incredible come back just to get into the match play championship. He was eight-over-par for his first nine holes as he shot a 43 on his first nine the first day. He then rebounded with a 35 on the back nine to finish with an eight over par 78 and stood in 63rd place. Only the top 32 advance to match play. But, Nottingham shot an even par 70 on the second day, one of the best rounds of the day, and tied for 21st after stroke play. He was seeded 23rd entering match play. Nottingham won two matches on June 28th, a 4 & 3 win over Ricky Castillo, a junior player from California, and 4 & 3 over Matthew Wetterich, a player from Xavier University in Ohio. Nottingham won two matches again on Thursday, June 29th. He downed Chris Petefish of Georgia Tech 4 & 3, then won a marathon over Alex Swalley. The match lasted 22 holes before Nottingham won with a par on the fourth extra hole. That set up the championship match on Friday with James Anstiss, a golfer from the University of Southeast Louisiana. Nottingham lost the first hole and trailed for much of the match before taking the lead with a birdie on the par three 17th hole. “My tee shot went by the hole by about an inch and stopped four feet from the cup. I then made the birdie putt.,” said Notingham. Both players made bogey on the 18th hole, giving Nottingham a 1-up victory. “After the first nine holes of stroke play, I just decided to hit the ball to the middle of the green and try to make pars,” said Nottingham. “Par is a good score on Pinehurst No. 2. I just wanted to make the cut at that point. By virtue of the victory, Nottingham gets a locker at the famed Pinehurst No. 2 clubhouse.